The Hella FF50s my bike came with are pretty beat up from road debris and are ready to be replaced. As I shopped for another pair, I'm started to realize that when it comes to night time lighting, I'm FAR more likely to be sharing the interstate with a lot of other vehicles than to be cruising across Alaska keeping my eyes open for moose (mooses?). The Hellas will certainly light up the road, but they're too bright really to use if you're sharing the road. My concerns are compounded by having already upgraded my main headlight to a 80w/100w H4 which would really push my electrical when paired with two 55w Hellas. I'm looking for an affordable LED driving light option that actually helps me see, rather than just be seen. Most of the low budget LEd lights on eBay or Amazon appear to just be big flood lights (another way of saying glare); they might be fine on a logging road but not on the pavement. Some of the other names (Rigid, Denali, Mondomotos, etc.) may have better lens and light control, but they're very expensive and they're probably also too bright to share the road with others. Super Bright LEDs seem to have a loyal following here on COG. They offer two models of "Mini Auxiliary Lights" which might work, but I wanted to know if any have tried them before I take the plunge. 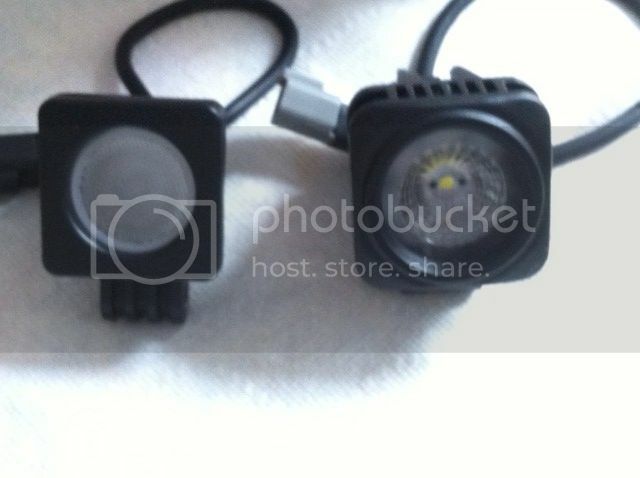 Their "10W Mini-Aux, 2" Modular LED Off-Road Work Light" comes in differing beam patterns. I'd like to match up a 10° and 30° light, and at just under 1000 lumens each, might be toned down enough to use on the road but still see the road better. On the downside, at 6500K, the very blue light is obnoxious. The alternative "2" Round 10 Watt LED Mini Auxiliary Work Light" are only 700 lumens each and is not offered in a narrower spot format, just 25°, but it does use a more visually pleasing 5000k light. Price is similar at about $100 for a pair, both are IP68 rated for water and dust, and both are similar in their electrical demands. My existing Hella wiring will handle the LED's, no no need for new switches or relays Feedback from the masses on these lights or affordable alternatives? Last note: HID conversions of either the main or the Hella is not on the table. I commute in the dark and I am very put off by the blue glare monsters I share the road with. I love the factory designed projector lights, but the conversions don't impress me. I can't comment on the LED lights - and if fact I am interested in seeing the replies. That said, be aware that not all HID lights are those goofy blue lights. HID lights come in different "colors", or ratings. The lower numbers are much warmer colors - very comparable to incandescent or halogen lights. They actually are easier to see with, putting more usable light on the road, and are less offensive for other drivers. Most of the blue light kits are actually sold to posers who think that the blue lights will fool everyone that their Civic is actually a high-dollar exotic! 110watt PICA incandescents on a truck with the 5 degree pattern. one seem to be bothered. I use ADV monster 30's as my aux lights. They put a whole heck of a lot of light down range. Even though they say "spot", I would say their beam pattern is similar to a headlight. 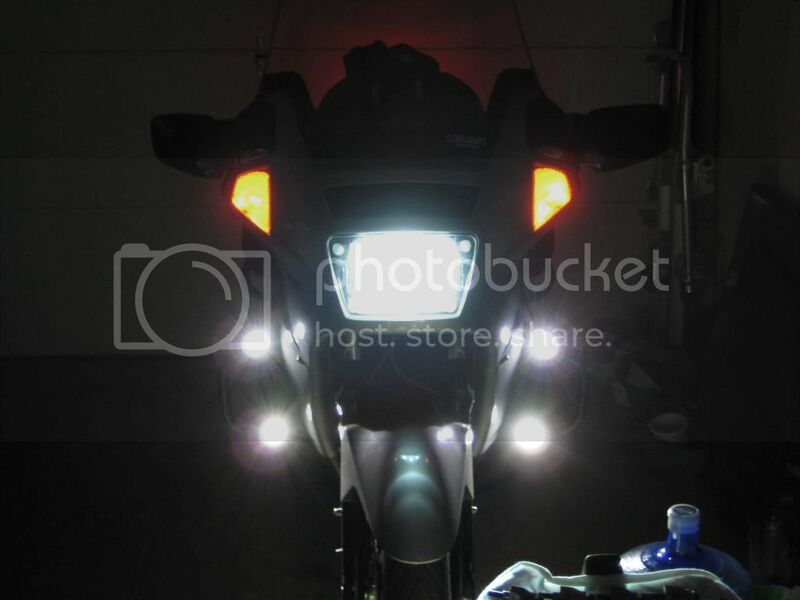 On my old Hyperstrada, one of these had better output than the low and high beams combined. The effect is less on the C14, since it already has some pretty powerful lights, but they still serve to light up the edges, and give a very full view while riding. I definitely recommend them, especially since their price is not that much. edit: forgot to mention, I put these on a dimmer, so I could use them as "see me" lights when I didnt need the extra lights. Did you check out the long-running thread on the MondoMoto lights? I too would like to add riding LEDS to my C-10. I am thinking of putting them on the front forks where the brake line bracket currently is. I have one hid headlight, isn't blue, draws more power at startup but only draws 30w constant. After riding a bike with one I felt that one was all I needed. My search for aux lights always takes me back to the Denalis with 4 LEDs - 2spots and 2floods. Twisted throttle has them for investigation purposes and there are threads worth searching with them also. I'm on my phone or I would throw some links up here for ya. Specific to your question regarding the SuperbrightLEDs 10w Mini-Aux 2” Modular lights (currently $42.95 each), I have 4 of them installed on my C10. 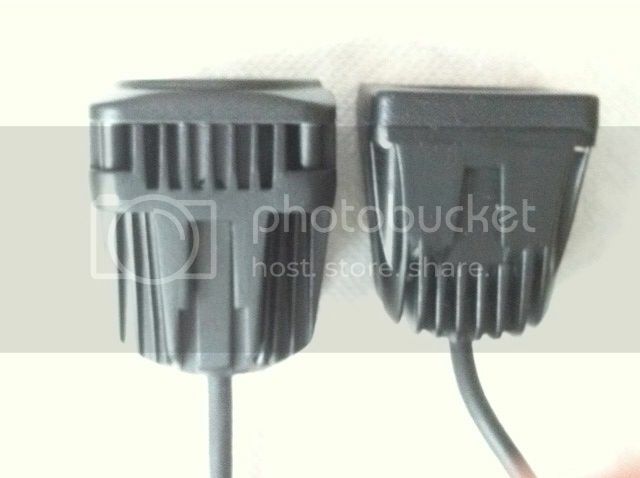 I purchased two 20 degree (spots) and two 60 degree (floods) to augment my 35 watt HID headlight. The thinking was to run the 60 degree floods continuously (running lights) and have the 20 degree spots toggle on and off with my high beam. The idea came to me after having a HID headlight fail at nightfall on another C10 but still being able to drive home fairly easily due to having supplementary Mondomoto MM15s (a pencil/flood beam light no longer available) on board. So, the two Superbright 60 degree lights were added to my tip-over bars as always-on supplementary lighting, while the 20 degree spots were added to supplement the feeble high beam associated with my HID headlight. The light they provide is strong and beneficial, rounding out and broadening what is provided by my HID headlight. The high beams do throw welcomed additional light down the road, but are not what I’d call “night splitters.” All lights require careful aiming to avoid blinding on-coming drivers, and I have not experienced people repeatedly flashing their highs at me to alert me that my lights are too bright. However, YMMV. As to longevity, I experienced failure of both of my 60 degree floods within the 1 year warranty period (at about 4 months). SuperbrightLEDs customer service was spot-on and very quickly sent me out replacements. Unfortunately, one of the replacements failed, too (at about 4 months), so I was sent yet another replacement. However, this third time, the replacement lamp was different in design and packaging. It is currently on the bike and working well, having added much appreciated lighting during the night-time portion of a SS1000 last June. So, it seems that between my initial purchase and now, the 10w Mini-Aux 2” Modular lights have undergone a redesign/new supplier. SuperbrightLEDs customer service has been great--very easy to deal with, responsive, professional, and hassle-free. To complete the longevity portion of my review I'd like to point out that my original 20 degree spots (used in conjunction with my high-beams) have continued to work flawlessly since the original date of purchase (July 2013). Whether or not they suit your purpose (supplemental light without blinding others) I can’t say. But, to give you some idea of how they look, I’ve included some garage photos (limited though they may be) of my lights, as well as of some photos of the differences between my original lamps and the eventually successful new design running on the bike. Thanks for the feedback and pictures. Your last picture reminds me of something from Close Encounters of the Third Kind. You've addressed most of my questions. I appreciate the prior responses but several missed the criteria that I am concerned about, namely affordability and being able to use them with other vehicle in the road. Granted, affordability varies from person to person; for me I've drawn this line at less than $150 including any additional wiring or switches. Some of the Denali products have similar specs to the Super Bright LED product line, but at more than twice the price. The MomdMotos also seem to parallel some of the SBL products; I've read that their customer service is hit and miss, and water leakage seems to occur too frequently. It's tough as a consumer to shop for these lights. A few out there seem to be the real deal, with good water proofing, good lens, consistent quality, and good customer service. Then there are the many re-branded knock-offs that look the same and have have identical specs on paper, but whose quality is sorely lacking. I'm getting by with the one HID for now. No aux lights as of yet. This technology is becoming better and cheaper all the time. I'm still holding out! Fais.... I went to wally world and got two oval shaped blue fog lights/driving lights. I mounted one upside down and below the headlight to the fairing where that black cover is. I put an illuminated switch and hard wired it in the left fairing pocket. I had to waterproof it with clear sealant. It is more than enough to fill in the gaps of the stock headlight on those dark mountain roads, and have a spare. Cost less than $20.00 and looks cool on my red C-10. More than enough lighting and I can turn it on without the bike running in case I need instant light at night in a campground! 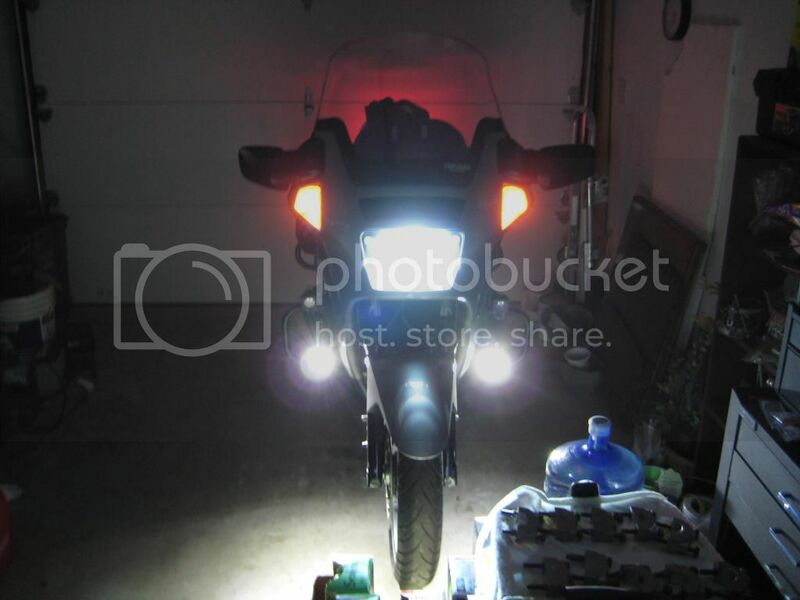 Post a pic of the fog light on your bike for us to see if you get a chance. I've been wanting to install a pair of those to come on with my reverse lights on my truck and see how I like them. Camping light/spot light would be a nice bonus feature. Most of the blue light kits are actually sold to posers who think that the blue lights will fool everyone that their Civic is actually a high-dollar exotic! To me my Civic IS a high dollar exotic. It still has three hubcaps, most of its paint, AND a trailer hitch. I run HID lights on my Vstrom and the light provided is incredible! No matter how I have them aimed though oncoming drivers flash me as the light they provide is intense. Especially in the rain at night (when you need them) the high beams of oncoming drivers momentarily blind me. For this reasons I do not select my Vstrom for night riding on streets. My concourse, however, has the stock lighting set up augmented with Twisted Throttles Denali D2 auxiliary lights which provide a surprising amount of light. They can toggle between high / low beam with your stock setup, stay on high always and be switched on / off as needed. I have these lights fork mounted angling slightly down and out to provide lighting into corners, increase illumination at the side of the road where deer tend to hide, and to not blind oncoming drivers. Additionally, the setup provides some redundancy if your headlights fail. They are pricey but are guaranteed for life. Now that I have the COG decal on my windshield I am afraid of riding it today because I may get bugs on it lol. No, really I have to watch the store today whilst Lorri makes the wedding invites! Page created in 0.367 seconds with 25 queries.